I’m not sure what I did before Amazon Prime. It’s become my go-to for everything from dog food and kitchen gadgets, to jewelry, travel essentials and gifts. No more going to miscellaneous stores or waiting a long time for orders to come in – it’s 2 days with a click of a button. 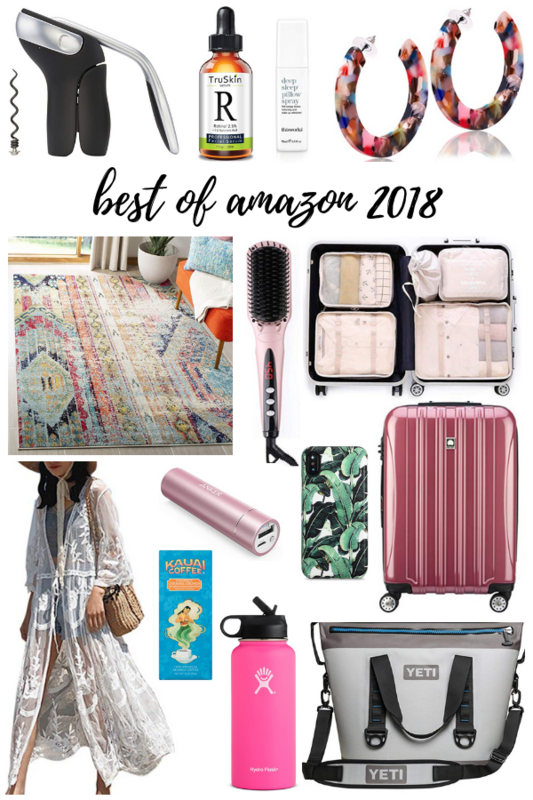 I looked back at alllll of my purchases over the past year to give you my best Amazon finds of 2018. Tt was hard to top 2017’s Dash egg cooker or this compact spiralizer, but this year’s picks included several significant purchases for one reason or another. Whether it was changing the way I pack for travel or accessorizing with trendy, inexpensive pieces, Amazon did it all. If you’re on the hunt for a good gift for a guy in your life, I highly recommend a Yeti cooler. And while I didn’t list out baby and toddler gifts below, I also purchased little board book sets for several of the nuggets in my life (here & here). Here are my top picks in no particular order, which I love for all different reasons. 1. Acupuncture Mat: If you’re curious about what acupuncture can do for you but aren’t into needles or committing to appointments, try this super affordable acupuncture mat. Lay on it for 20+ minutes a day and relax – promise it doesn’t hurt. How crazy is it that Christmas is less than a week away! I was so organized and had most of my gifts purchased before December event started… and then I had a big lull and need to finish up this week. 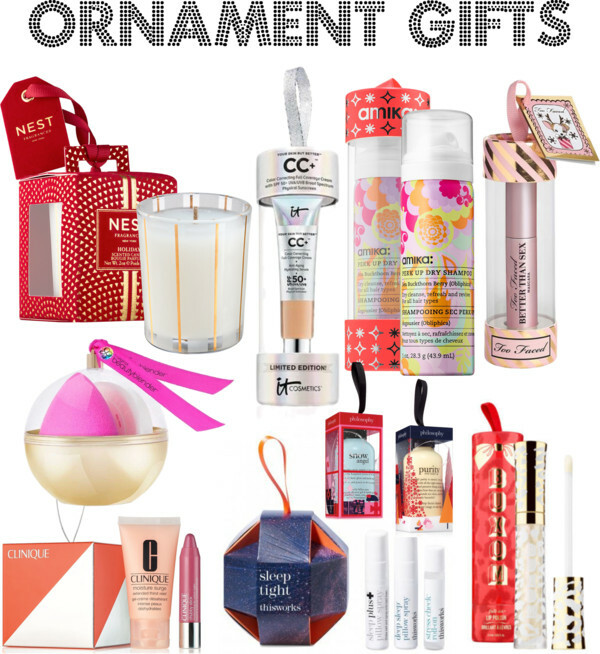 Ornaments are such a good last-minute gift idea – and this year you can take that idea up a notch with all of the beauty, skincare and even home-themed ornaments that come with presents in them! The packaging is so fun and you can either gift them as-is by hanging them on the tree or give them as stocking stuffers. I’m sharing details on some of my favorites below – and you can shop even more at the bottom of this post by scrolling and clicking on the ornaments in the widget. 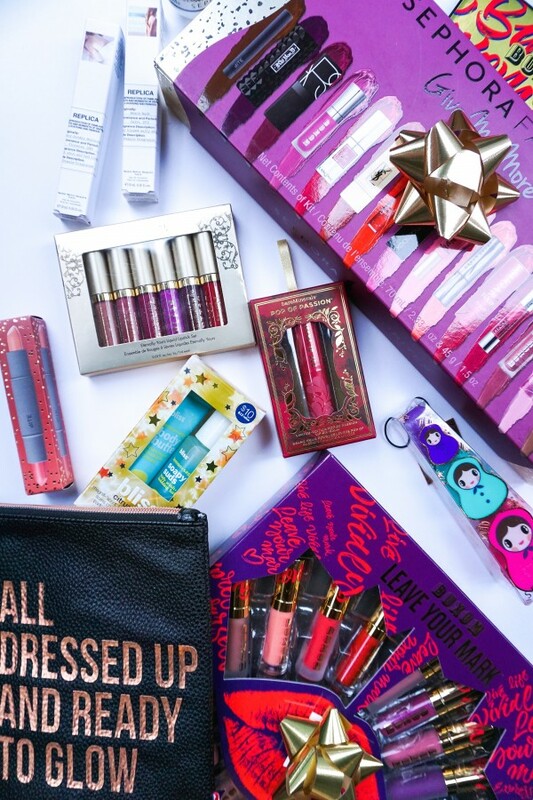 Grab an ornament gift online or at stores like Sephora, Ulta or Target. 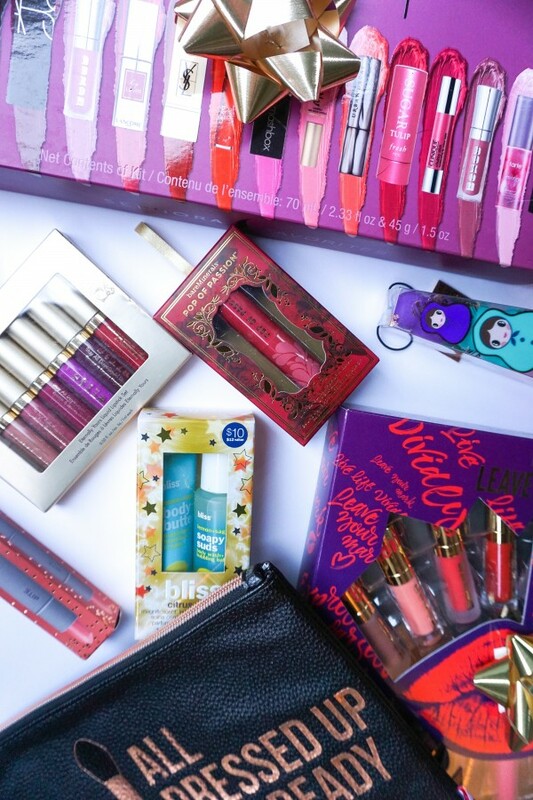 What are your favorite stocking stuffers or low-cost gift ideas that come in cute packaging? 1. Nest Candle: You can’t go wrong with a candle from this brand. They’ll make your house smell like a luxurious spa. 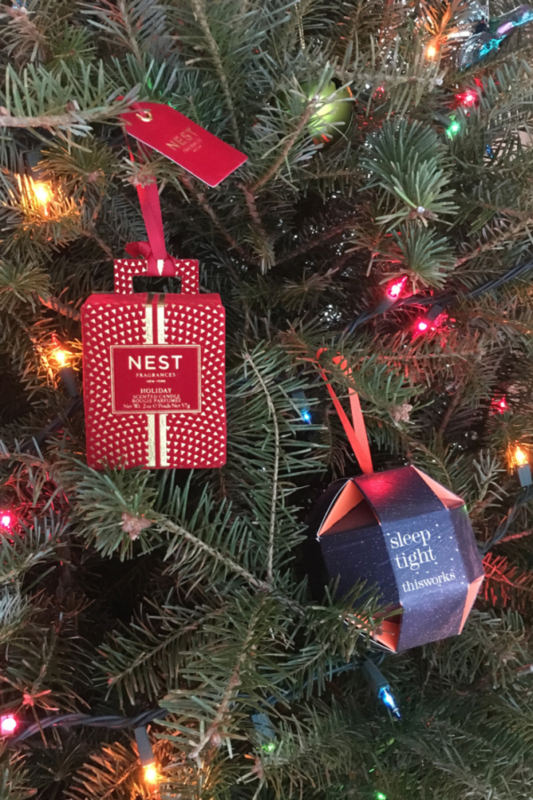 The ornaments come in the best holiday scents that will make you want to go back for a bigger version. 2. IT Cosmetics CC Cream: I tried this out for the first time last week and have been loving it! It’s lightweight yet still gives you nice coverage that actually stays put. Extra bonus is the SPF 50. 3. amika Dry Shampoo: I’ve always heard great things about this but have yet to try it out. Might have to grab this ornament to try it out as a travel size and take it on my next trip! 4. Too Faced Mascara: This has been one of my go-to mascaras for years (I tend to switch them up and layer depending on where I’m heading). It gives you lots of volume and people are obsessed with it. 5. BeautyBlender: Almost New Year, so probably time to either replace yours or grab one for the first time – it’s a game changer when it comes to applying things like CC cream or foundation. I just learned the best way to use it is by running under water first so it doesn’t absorb all of your makeup! 6. Clinique Merry Moisture Set: This comes with their popular moisturizing lip balm crayon and face lotion. These products are a pretty safe bet for anyone who likes to at least wear a little lip color. 7. thisworks sleep tight: This is perfect for a new mom or someone who needs a good night’s sleep. It comes with 3 essential oil products – 2 pillow sprays (one to help you fall asleep, another to keep you asleep) and a de-stressing aromatherapeutic rollerball that will relax you for bedtime. 8. Philosophy Bubble Bath, Shower Gel & Face Washes: You can’t go wrong with any of these – they smell so good. They also have some of their popular face lotions in ornament packaging. 9. Buxom Full-On Lip Polish: I always come back to this brand for lip gloss – and this one will give you a nice gloss that also works over your favorite lip color. Thanks to Nest, IT Cosmetics, Buxom and thisworks for sending samples to try out! This post contains affiliate links. Happy Black Friday! It’s time to recover from Thanksgiving and kick off Black Friday shopping, whether you plan to do so in-store or from the comfort of your couch. It’s crazy how Black Friday and Cyber Monday have now morphed into a week-long shopping occasion that starts even before Thanksgiving! My cousin and I made a tradition out of outlet shopping on Black Friday several years ago (we go later in the day once the crowds die down!) so that’s where I’ll be headed in a bit, but in the meantime there are so many online sales to shop! I’m rounding up the best sales below, along with my favorite picks for both gifts for others (or yourself) and everyday style finds to add to your wardrobe while prices are low. All you have to do is scroll through the widgets below and click through to buy. Happy shopping – and hope you’re all enjoying the long weekend with your loved ones. The pre-holiday season got the best of me and admittedly I am WAY behind on my gift guide content that I had originally planned (sorry!!). The holidays are now here, but I’m sure I’m not the only one who hasn’t quite checked everyone off the gift list yet. One of my favorite things on Christmas morning when I was little was opening up my stocking – my mom wrapped every little thing in it so it took forever! So today I’m sharing lots of last-minute stocking stuffers from either stores you probably have nearby or good old Amazon Prime. Bought all your gifts already? Pick some of these up for yourself – especially the gift sets that are only available at this time of year and are usually great value! Shop everything via the links and images below, where you’ll find even more options in each category. Happy Holidays, everyone! Hope you all get to disconnect and spend time with family and friends. Happy Friday! It’s been a crazy few weeks and I’m long overdue for a beauty post. A few months ago, it was National Lipstick Day (did you know that was an actual thing?! 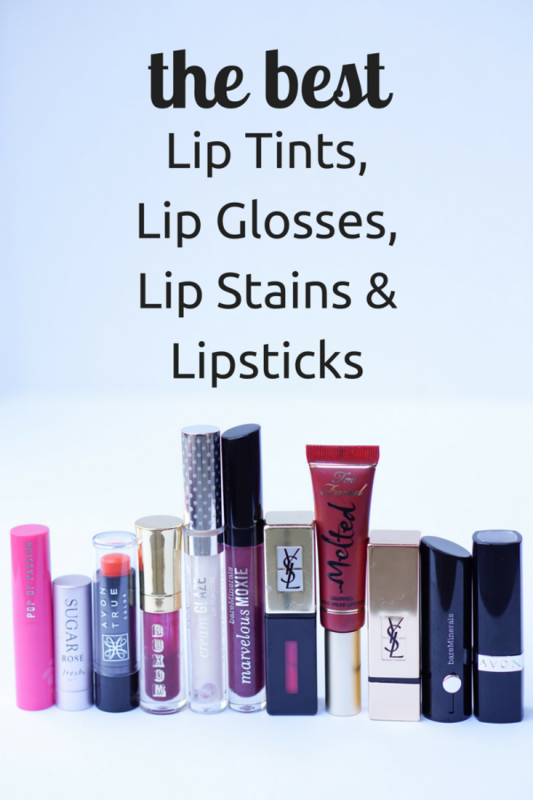 ), and it made me want to put together a post on the latest lip products. But then I decided to head straight to all of the bags I use on a regular basis and pull out the lip products I’m using – and loving – right now. Thanks to this blog and Sephora being across the street from my office, I’ve tried out lots of lipsticks, glosses, stains, balms, you name it, over the last few years. It wasn’t until my wedding three years ago that lip color became one of the two beauty products that make me feel most put together (mascara is also must for me!). I went to Sephora in search of a natural-looking lipstick that would actually stay on for our big day because I knew I was going to forget to reapply, and that’s when I discovered my go-to YSL lip stain (more on that below). Since then, I try to have some sort of lip color on, especially if I’m out at night. Read on for my current faves and exactly what it is I love about each, along with my go-to lip treatment that I use daily. Let us know what your recommendations are in the comments below! 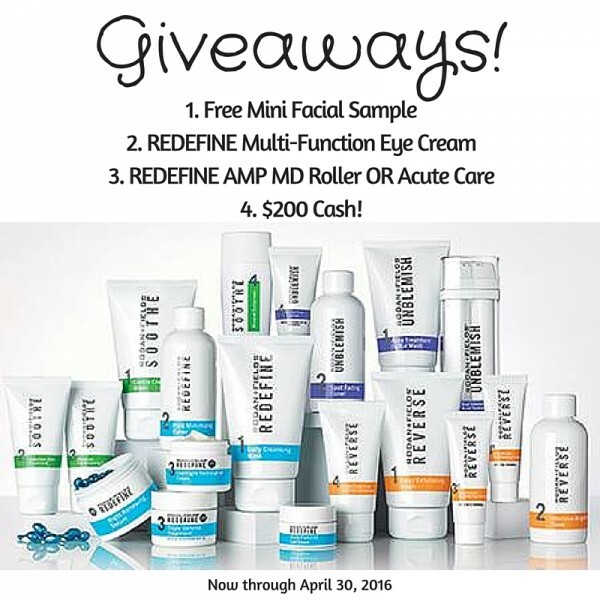 Rodan + Fields Skincare & 3 Giveaways! Today’s post is one I’ve been wanting to share for a while, as it’s all about my new skincare routine that has really made a positive impact on me. Ever since I started using skincare of any type, I’ve been all about convenience, especially at night, as I tend to get tired and lazy. I’ve tried out (and loved) many products over the years, but over time switched from one brand or product to another. Enter Rodan + Fields, from the doctors behind Proactiv, and my redness and wrinkles are nearly gone and I don’t even feel the need to wear tinted moisturizer or foundation anymore. The line was originally sold at department stores – and was the #1 skincare line at Nordstrom – until the founders decided to shift the distribution and marketing strategy to direct selling. 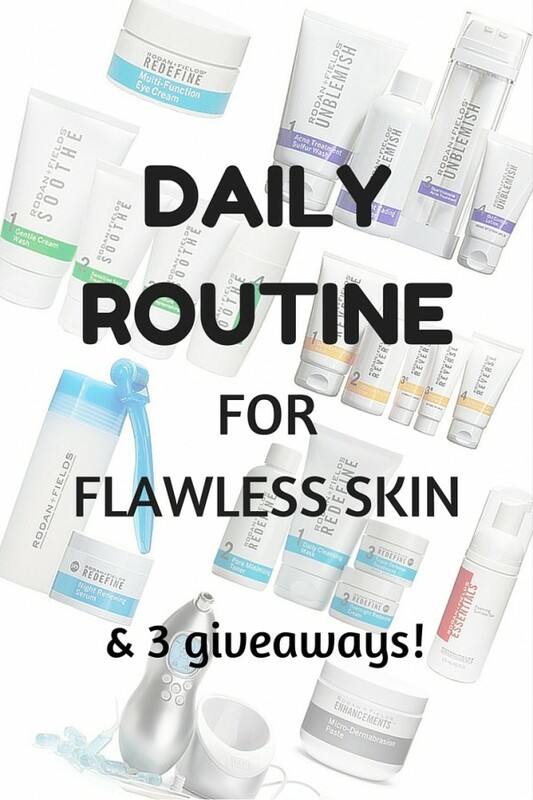 Read on for my experience with this skincare line and enter the giveaways at the end! Rodan + Fields was intriguing to me for two reasons: the before/after pics of real results and the 60 day money back guarantee (even if the bottles are empty!). So I took the solution tool quiz, figured out which products were right for me (SOOTHE regiment for redness/sensitivity, along with the REDEFINE Overnight Restorative Cream and Multi-Function Eye Cream for wrinkles/anti-aging), and went ahead and placed an order. This may sound like a lengthy routine for 2x/day, but after I got used to it, the step-by-step system really didn’t bother me. Trying out Rodan + Fields was a bit of an experiment for me, as I had never documented how products worked with before/after pics. I also stopped using other skincare products to truly see what the R+F results were. Honestly, I was not expecting to be as impressed as I was. After 1.5 weeks, my before/after pic clearly showed reduced redness (one of my friends said it looked like “night and day”!). I also quickly noticed the lines on my forehead and around my eyes become much less noticeable. One of the things I love most about Rodan + Fields is that it’s not a one-size-fits-all product line. 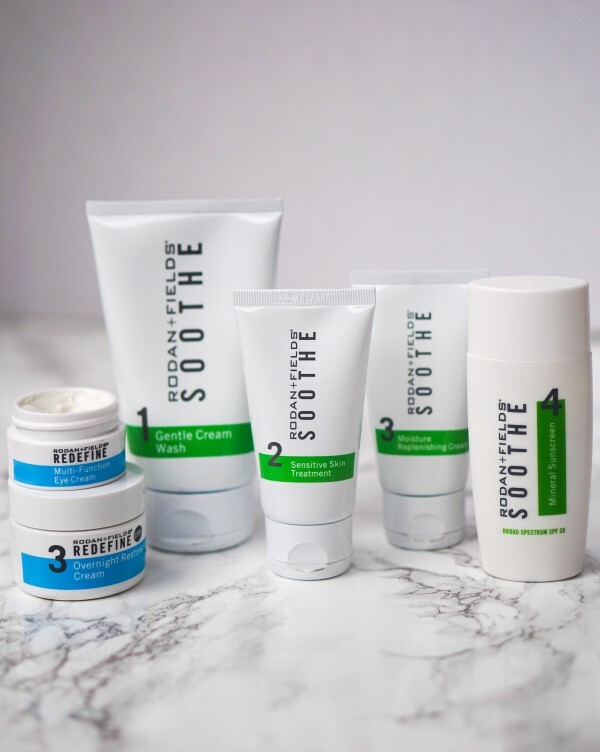 There are four different regimens – SOOTHE (redness/sensitivity), REDEFINE (wrinkles, firmness, anti-aging), REVERSE (brown spots, dullness, discoloration) and UNBLEMISH (acne/post-acne marks) – and you can use combinations to address more than one skin concern. All you have to do is take a quick quiz via the solution tool to reveal which regimen(s) are best for you. From there, you can add on things like the REDEFINE Macro Exfoliator, Acute Care for Expression Lines or AMP MD Roller. Becoming a R+F consultant was also not something I saw myself doing, but once I had such a great experience with the products myself and learned about the promotions going on for new consultants, I was sold. I saw one of my high school friends making enough income to stay home with her kids a few more days a week and I realized that even though I don’t consider myself a sales person, I could stand behind and spread the word about quality products. Plus it doesn’t hurt to get the products for myself as discounted as possible! If this is of interest to you, comment or email me at katyc.rodanandfields@gmail.com and I can give you more info. Right now, you can earn double your initial investment back. And much like blogging, there’s a great community to connect with via Facebook, events, etc. Note: As a blogger, I want to make sure that I’m sharing the latest and greatest in the skincare world with you, so don’t worry, I won’t be posting about Rodan + Fields every week! I’m always looking forward to testing out new products and will continue to do so, adding them to my skincare routine here and there where it makes sense. Plus I know we are all looking for products for different uses, at different price points, etc. Giveaway! Like I said, I wasn’t hooked on these products until I tried them myself, so I wanted to give me readers the chance to win Rodan + Fields’ popular REDEFINE Multi-Function Eye Cream ($60 value), which sells out on the reg. AND as one of the entries, you can fill out a quick survey and I’ll send you a FREE mini facial sample (note: if you opt into this, I’ll follow up via email for some feedback). Giveaway open to U.S. residents only from now until April 30, 2016 and free mini facial samples available while supplies last. Bonus Giveaway! Here’s where it gets even better. For anyone who makes a purchase of $100+ through my Rodan + Fields site and signs up as a preferred customer will be entered to win your choice of the REDEFINE AMP MD System ($200 value) or Acute Care for Expression Lines ($210 value) on me! Being a preferred customer will also get you 10% off and free shipping from there on out. Find out which regimen is for you with the solution tool (quick survey). Note: the 60 day money back guarantee will not apply on this giveaway item. Giveaway open to U.S. residents only from now until May 31, 2016. Bonus Offer for New Consultants! This is for those of you who want to go all in and become my business partner as a side- or even full-time gig! Sign on as a consultant here with the $395, $695 or $995 starter kit and I’ll personally give you $200 cash back after 60 days. Rodan + Fields also has a promotion going on right now where you can get double your initial investment back. Email me at katyc.rodanandfields@gmail.com for more details on this offer and to redeem the offer once you’re signed on. Happy to answer any and all questions! It’s hard to believe I actually started this blog just over two years ago. This morning I scrolled through every single one of my posts from 2015 and it dawned on me how far I’ve come this year. Not only have I experimented with new types of posts (#ootd, monthly beauty finds), but I focused on paying attention to what was resonating with you, my readers, and tried to up my photography game to bring you lots of visual content. As a result, my blog readership and Instagram, Pinterest and Twitter followings doubled! 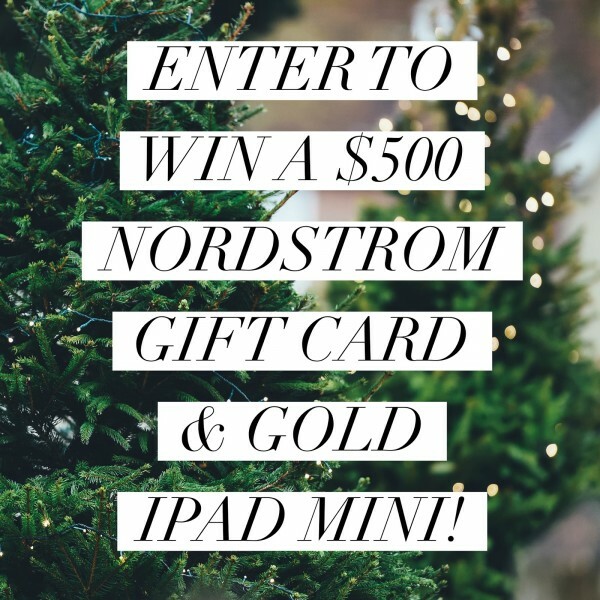 Today’s post includes my favorite from each month this year – and scroll down to the bottom for a big Nordstrom & iPad giveaway! Aside from the blog, 2015 was another incredible year spent with friends and family. I adventured to Ireland and Hawaii for big trips in summer and fall, and traveled to other new destinations, such as Portland, ME & OR, for work and play in between. Throughout the year three out of eight of our group of college besties welcomed beautiful babies, one got married and we even managed to successfully get all of us out to San Fran for a long weekend. And here at home, our mini bulldog, Hank, keeps us happy as ever. My husband and I are headed into the city for dinner and drinks tonight and tomorrow we’ll meet up with our friends to kick off 2016 at the beach for the third annual PJ brunch party. I hope you all take some time to reflect on the ups and downs of 2015 – and cheers to a happy and healthy 2016! Rules: Use the Rafflecopter form to enter daily. Giveaway ends 1/15 and is open worldwide. Winner will be notified via email. I’m usually so organized about holiday gift giving, picking out and buying presents for everyone in my list way in advance. For some reason, this year that just wasn’t the case. But thanks to a few of my favorite stores with great free, expedited shipping policies (placed a big order at J.Crew Factory on Monday and it arrived today!) and stores that carry pre-packaged gifts, I’m still good to go. Today I went into Sephora and there were lots of fun gift sets still available – and they’re even open until 6 p.m. on Christmas Eve, so you can still pick some up before the holiday! And I love that most brands package up their most popular products into pretty stocking stuffers. Two of my favorites are bareMinerals’ Pop of Passion, with one of their new lip launches from this year, and Precious Pearls, with their top-selling powder eye shadows – both are actually ornaments! 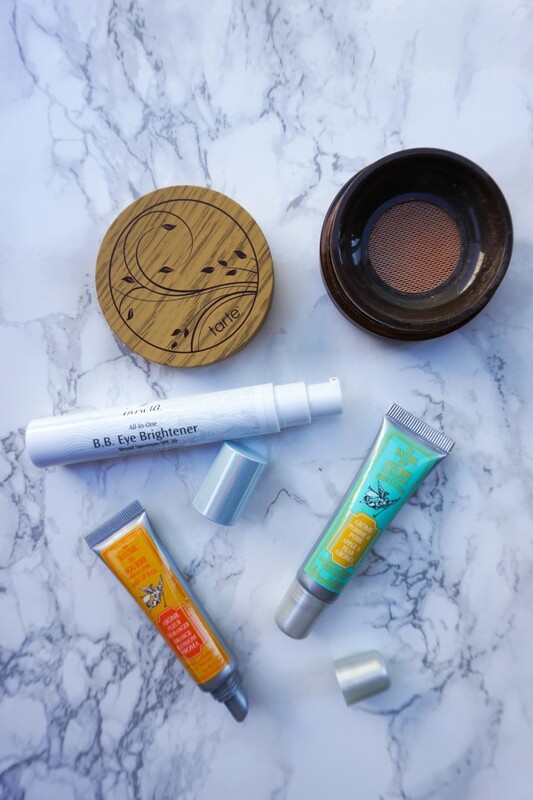 I also love Bliss Spa’s Citrus Stars, which comes with the body butter and soapy suds that I currently use daily, and Bite Beauty’s Luminous Creme Lipstick Duo, also with fun, sparkly packaging. If you don’t have time to head to the store on Christmas Eve, I recommend you check out my gift set picks below, because some are already on sale and available while supplies last. The Sephora Favorites are always great because they include their top products and colors in any given beauty category (lips shown below), giving you the opportunity to try sample sizes before you buy your next lip color. And speaking of lips, the past few years I’ve stocked up on Buxom’s Full-On Lip Polish and Creams with their gift sets because of the value – and this year the Leave Your Mark set is perfect. Shop my last-minute beauty gift set and stocking stuffers using the links below and Merry Christmas Eve! Need more gift ideas? 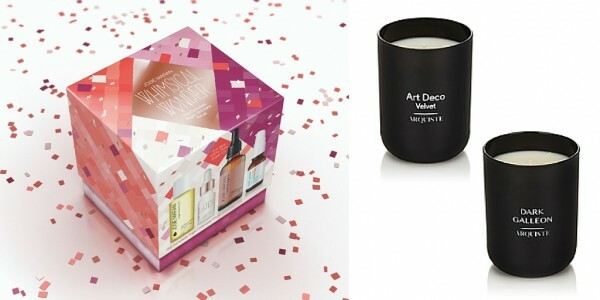 Below are a two more recommendations – Josie Maran’s Whimsical Wonder The Complete Argan Skincare Ritual and ARQUISTE’s Holiday Candles. 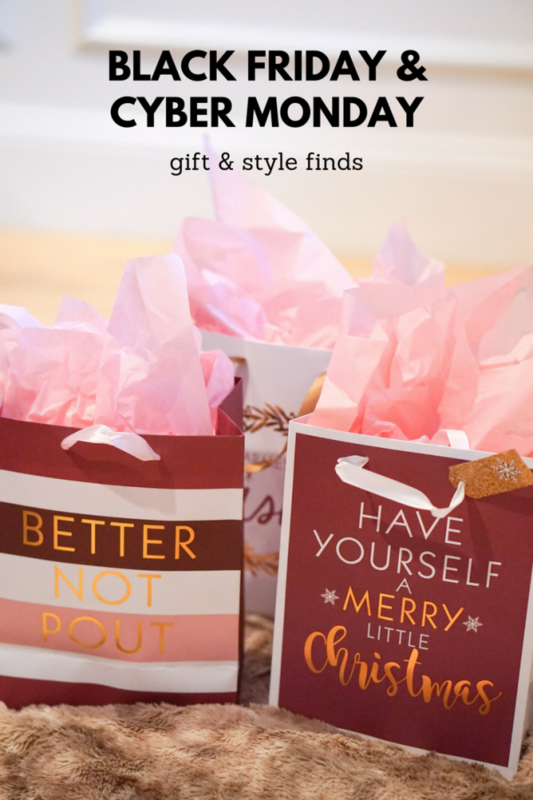 And you can also check out my gift guide on Fit & Fab Living! 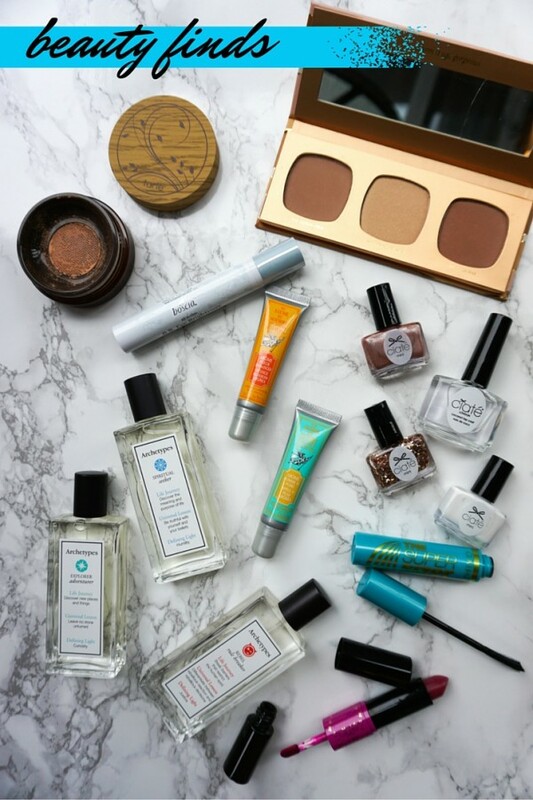 This month’s beauty haul brought me lots of new favorite products that I’m excited to share with you all today. 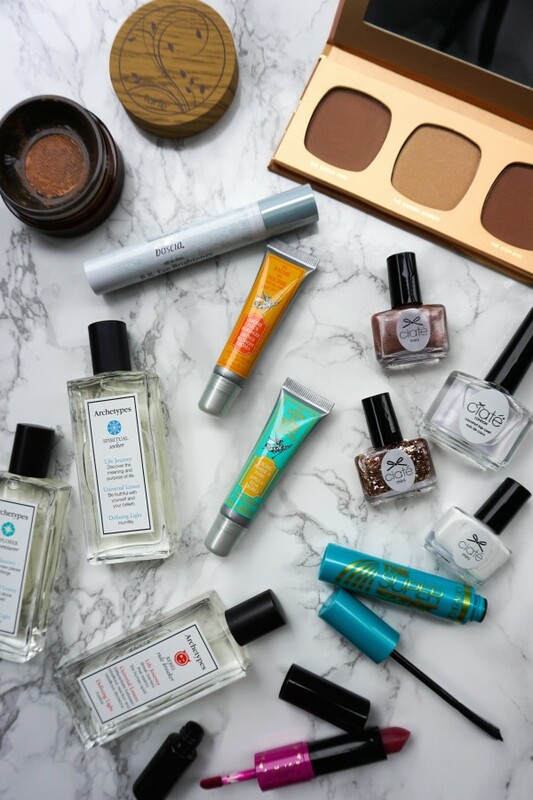 From powder foundation that makes your skin look flawless to under eye cream that brightens up any skin tone, there’s something for everyone. Read on for my reviews of the seven products below and shop them all using the links below this pic! Airbrush Foundation… in a weightless powder format. If I go to the gym in the morning, I have a 30 minute window to great ready and out the door, so in the past I’ve stuck with tinted BB cream for my weekday face makeup. But now that I’ve tried tarte’s Amazonian clay full coverage airbrush foundation, my everyday routine has included foundation. It’s so light that it doesn’t feel like a foundation, it lasts for 12 hours and covers up my redness with just one layer. The foundation comes in 16 shades and their shade finder makes it easy to pick the right one without even going to a store (I use medium neutral). And I think my skin could actually pass off as being airbrushed! B.B. Eye Brightener… OK so earlier in this post I said that mascara is my top priority when it comes to makeup, but right behind that is under eye concealer/brightener. I’m a great sleeper, but the older I get, the bigger those bags get. Boscia’s All-In-One B.B. Eye Brightener Broad Spectrum SPF 20 conceals, brightens and hydrates that delicate area under and around your eyes, helping to prevent dark circles, puffiness and pigmentation, all while giving your antiaging benefits. I love that it comes in one self-adjusting shade, so you don’t even have to test out shades before buying. Lip glosses… that soften, nourish, protect and repair your lips, which is exactly what I need for the dry, winter weather that’s on it’s way. I’m loving the Le Couvent des Minimes Smile Lip Balms, which come in four different scents: Apple and Pear, Rose and Berries, Orange Blossom and Citrus. I’ve been keeping one in my bag and another in my jacket pocket so I always have them handy. Bronzer set… that gives you just the right amount of color for any occasion, from a subtle, sunkissed glow to a deep tan effect. The bareMinerals California Bronze trio comes with two bronzers – The Ocean View (sheer matte bronze) and The High Dive (tan) – and one luminizer – The Shining Moment (golden champagne). Bronzers and luminizers from bareMinerals have been in my makeup rotation for years and I love how they’re all universally flattering. With this palette, you can wear them on their own or mix them together to get the look you want! Nail polishes… that highlight your tan and smell good – and the Ciate London South Beach Socialite Collection does just that. It comes with four nail polishes – two rose gold shades with glitter and foil finishes, a white and a top coat. I love the look of the white with the rose gold glitter for a statement nail, finished off with the coconut top coat. The top coat has a coconut smell that brings me right to summer months, Hawaii and the beach – and I was surprised that the scent actually lasted beyond when I was applying it. Mascara… a.k.a. the one makeup item that I rarely leave the house without, and that’s mainly because I have very blonde eyelashes, so without it I look like I’m either eyelash-less or asleep. I use both drugstore and Sephora-worthy brands and oftentimes find myself layering different types to get the perfect eyelashes, especially if I’m going to dinner or a night out. But for my everyday work week look, I usually stick with just one, and the CoverGirl Super Sizer by LashBlast Mascara is perfect for that. I got so many compliments on day one of using it! The key to getting the maximum impact of this mascara is to twirl the wand as you put it on. Then you just keep layering it on to get the level of volume you want (I used one coat for daytime and three for night). Two-in-One Lip Color… I love products that do double duty because it means less in my makeup bag. Ciate London’s Lip Locked Tint and Balm Lip Duo is also part of the South Beach Socialite Collection and comes in two shades: In the 305 (berry) and SoBe (fuchsia). Start with the semi-matte lip tint then top it with the shea-butter-infused tinted balm. I love how smooth the balm makes my lips, and the tint can be layered on to get the level of color you want. Tip: if your lips are chapped, you can apply the balm first and last so the tint goes on evenly. Fragrance to go with your personality… after you take a quiz on Archetypes.com to determine your top three archetypes, or “patterns of behavior that explain why you do the things you do and love the things you love.” My top archetypes were explorer, creative and visionary, which fits my personality pretty well – especially considering the quiz was only three questions. 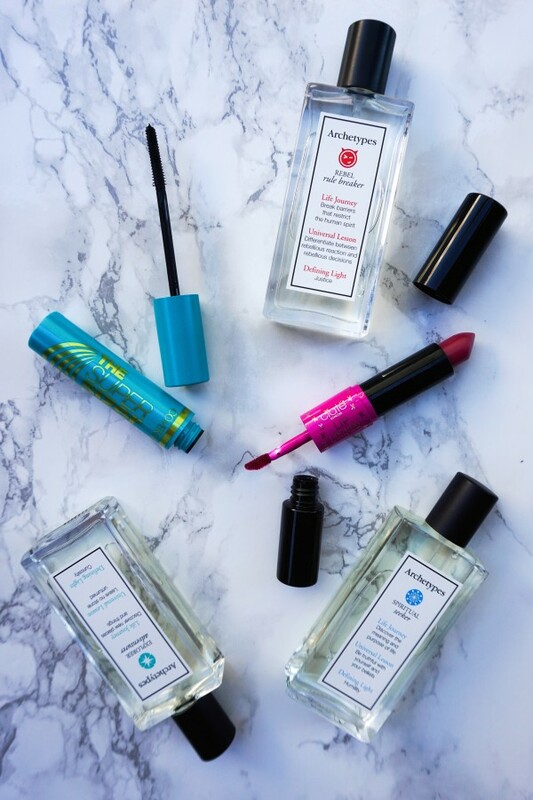 Shop the 12 fragrances here, then head over to your archetypes’ sections of the site, where you’ll find curated lifestyle content just for you, from beauty and fashion, to recipes, home decor, travel and more. 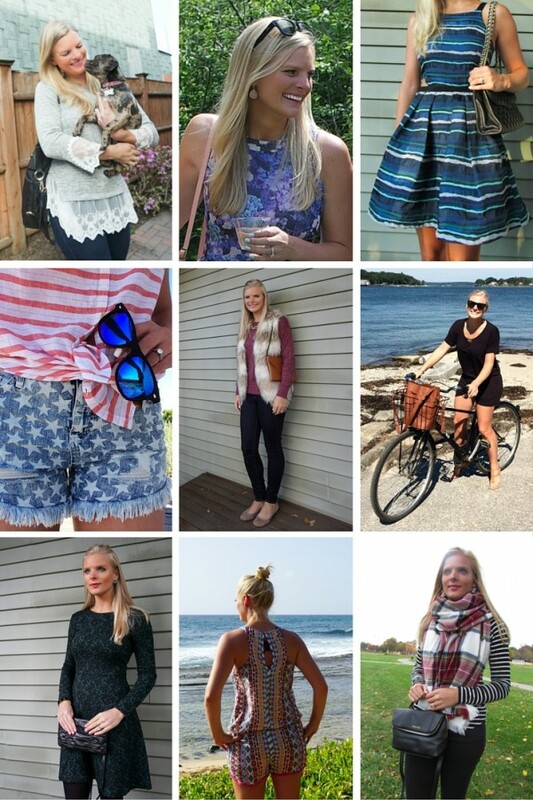 If you’ve been following along for at least a year or so, then you may remember that I had been contributing to Fit & Fab Living from time to time. I’m so excited to be writing for them again – starting with a fun post about “pink” products that give back to various breast cancer-related nonprofits to raise funds and awareness for research, etc. Head on over to Fit & Fab Living’s “11 Ways to Give Back During Breast Cancer Awareness Month” post to learn more about the pink products below from Drybar, Cureology Beauty, Morgan Taylor Lacquer, Avon, Paula & Chlo, HydroPeptide, Handful and Pilot Pens. And be sure to follow me on Facebook, as well as Fit & Fab Living, for more posts from yours truly!